Ancient Egyptians are considered by historians and Egyptologists as the first builders in history. Egypt built its cities along the Nile river with mud brick. The Romans introduced the fired brick in Egypt. Timber was not an option for the Egyptian builders due to Lack of suitable timber trees planted in Egypt. Doors, shutters and roofs were made of wood. Palm trees whose wood is not very strong were used for that purpose. Ancient Egyptians built many buildings with perfection using very simple tools compared with the current construction machinery. 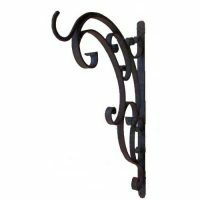 Our wrought iron brackets are hand forged by Egyptian blacksmith. The brackets are used to support advertising signs, garden planters, pot holders and lanterns.